We are proud to have Alexis Semeraro as our 2010 scholarship recipient. Alexis was selected for a $1000 gift based on her application and outstanding art portfolio. We expect to see Alexis’ name in lights someday. Her goal is to become an animator and film producer and help produce media for companies like Disney or Dreamworks. She has already established an impressive track record as winner of the 2003 Harborfest drawing contest, third place in the 2009 Memorial Day Salute poster contest and 2010 winner of the G. Ray Bodley Mural Contest. Alexis will begin pursuit of her career goals at the Rochester Institute of Technology in Fall 2010 where she is enrolled in the Media Arts Program. 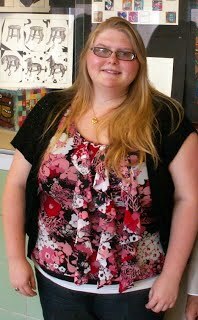 Aside from art, Alexis is a High Honors student, is active in the community and manages to work a part-time job. Alexis is the daughter of John and Brenda Semeraro. We look forward to providing our supporters with an update on Alexis’ progress.